Dramatic images have emerged showing a massive fire at a rail yard in Canada, which prompted the evacuation of homes and the closure of a highway. 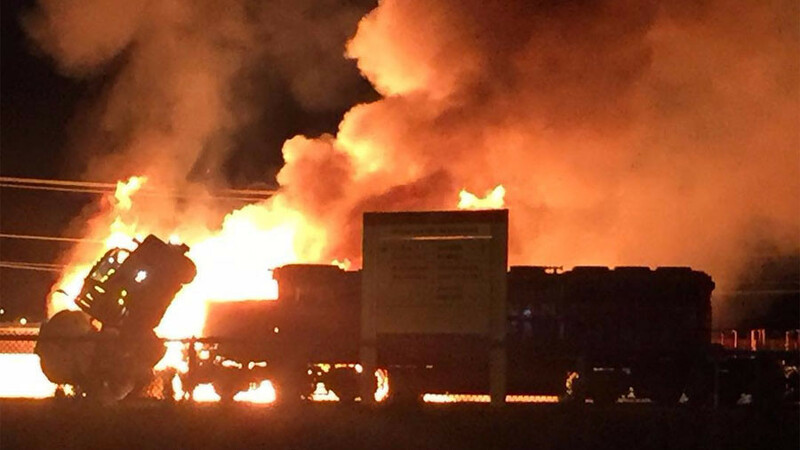 The fire in Port Coquitlam, British Columbia occurred when a train collided with a fuel truck near the yard's northern entrance, a spokesperson for Canadian Pacific Railway said, as cited by the Vancouver Sun. Nearby homes were evacuated as local fire crews worked to extinguish the blaze. "We have evacuated the immediate area,” said Cpl. Michael McLaughlin of the Coquitlam RCMP (Royal Canadian Mounted Police). Lougheed Highway was also closed as a precaution, and to give firefighters space to work. “No one is hurt at this point,” McLaughlin said. He added that, although flammable materials were involved, there did not appear to be any hazardous or toxic materials, and there is no health risk. The fuel truck involved in the collision was carrying ethanol gas, according to the Canadian Press. A foam truck and trailer was dispatched from nearby Abbotsford to help contain the blaze, according to Abbotsford Mayor Henry Braun.